1.22″ TFT LCD 2.5D High Sensitive Capacitive Touch Screen, HD fluent real your watch won’t be scratched. Bluetooth V3.0. 300mAh battery, Long standby. Support Network 2G GSM 850/900/1800/1900 MHz. Compatible with Android system and IOS system. Phone Function: Support make calls by Bluetooth or smart watch. 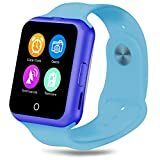 When insert a SIM Card ,it Simply like a GSM Cell phone, you are able to make phone Call / Answer Call / Dial Call directly from the smart watch; Without SIM card, it CAN receiving and making calls, getting texts via Bluetooth. Heart rate monitor. Built-in heart rate monitoring. The perfect combination of intelligent communication watch & built-in heart rate monitor. New UV Intensity Test Function. Let you know the intensity of ultraviolet light in time. It can timely to avoid radiation. More Functions : Pedometer, Calorie consumption, Exercise tachograph,Sleep Monitor, Sedentary Reminder,Anti-lost reminder, bidirectional search, Alarm clock, Calendar, Stopwatch, Calculators, Remote photograph. Player (Mp3),WAP, GPRS, Thermometer, Automatic Wake-up. Note: Android System can support All Function in the description; BUT IOS System ONLY Support : Passometer, Calendar, Call Sync, Calculator, Clock, Stopwatch while paring the bluetooth! BUT IOS only support: Passometer, Calendar, Call Sync, Calculator, Clock, Stopwatch while paring the bluetooth! * The smart watch is water resistant. Even you walk in the rain, the watch is safe. * CVC6.0 Broadband Noise Reduction. Noise environment, the sound is still close at hand. * Intelligent synchronous mobile phone informations will be on the watch. Step to remind and view your smart watch. At the same time it can be set up to filter. It is very convenient. *Language: English, Chinese, German, Spanish, Italian, French, Portuguese, Russian, Turkey.